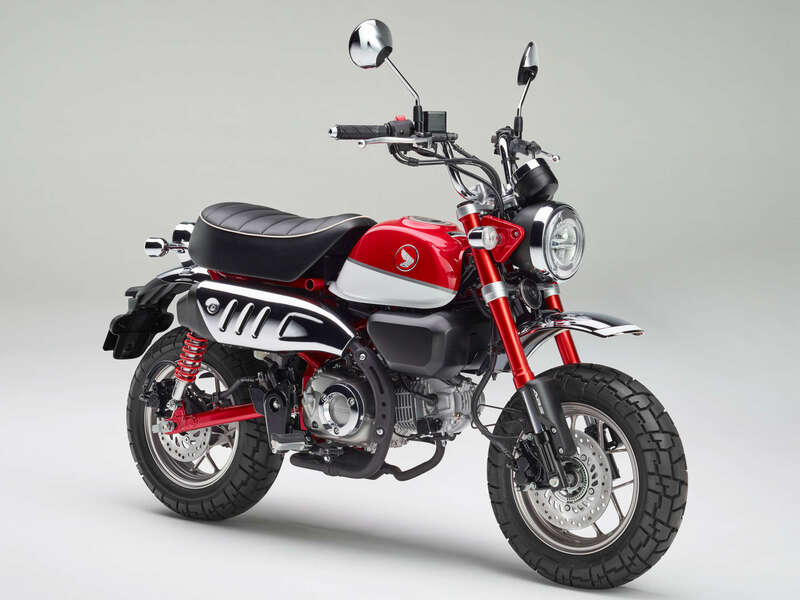 Touting its “aptitude for developing pocket-sized motorcycles that capture the fancy of enthusiastic subcultures”, Honda has announced that the new Monkey, powered by a 125cc single, as well as the Super Cub C125 ABS will soon be available in the U.S. market as 2019 models. Honda says the Monkey will arrive at dealers this October priced at $3,999, while the $3,599 Super Cub hits the market next January. Honda needs to make some TV commercials showing 20-30 somethings commuting on these in congested cities (LA, Denver, Dallas, Houston, Etc.) boasting 100 mpg, 4 bikes to a parking space, and giant smiles on the riders faces. Play them where these younger potential riders watch TV and internet. The Monkey needs about 8 times more HP. And better weather protection. And would it kill them to give it a nice looking exhaust and unitrak rear susp…..? At least 3 gallon fuel capacity, EFI, adjustable susp front and rear, Keyless ignition, heated grips. Ok, skip the grips. You mean it doesn’t compete well with a new Goldwing, Concours or K1300GT? What was Honda thinking? Where are the heated grips and seats? I can’t go 1000 miles a day on one? Honda must have morons in their marketing department! Every bike should have those features…then they would be all the same and you know that’s what people want. Touring bikes and nothing else. Seems like Grom sales are doing alright so maybe Honda knows something you don’t? Put my money down for a red Monkey today. The Cub is a one seater? That’s not right. Its a two seater when you put the optional pillion seat on. It comes with rear foot pegs. Due to tariffs to protect Harley, the prices are too high for 125cc. And why is the Monkey more than the other? Love the bikes, but if the motorcycle industry wants new young riders, the prices need to be much lower. I remember the Monkey from the 70s and we all had one! Come on Honda! Make them for $1800 and get more riders!! Tariffs to protect Harley ended about 30 years ago. Also, it was limited to bikes over 700 cc’s and had no affect on bikes like the Monkey or Cub. Prices are high so HONDA can actually make a profit and my bet is that dealerships will put additional markups on these little toys at first because of their popularity. Low fuel consumption, cheap initial cost and cheap insurance will probably move quite a few of these bikes. Cute as they are, I prefer full-size bikes when venturing out on the highway. A 1965 Honda C50 Cub would cost about $2400.00 in today’s money. Top speed of the C50 was about 35-40mph. The new bike has a fuel injected 125cc which will get better mileage to begin with along with lower emissions and much more power. Top speed of my CBR125R was about 65mph, so the Super Cub will likely be a bit slower. Still, it will be much more peppy around town than the previous models of Cubs. I think the new Super Cub is priced at about the right point. Ward, If you want them cheaper, and even more bike for the bang, then you might be interested in the SSR Razkull, and they retail for much lower than these. Razkull not enough? Then the new Benelli TNT 135 is for you, and even they are less expensive. I don’t even know why someone would want a Monkey over Honda’s own Grom. VanVan 200 for me. I wish I was a sub 100 lb teen, but I have a lot more girth now. The Suzuki Van Van is more my style and size. Just got a VanVan 200. Needs a longer shift lever. Will be regearing it. Need more top end. Nice little bike. Both cool little bikes, couple people even said, they would buy both. Really? Thats about 10k total. I must be out of touch. 4k for a mini bike, really? I am, still living in the 60’s, like others tell me. I doubt if I could get that for my good condition, 2012 VFR800. I know people who have 10k in a bicycle. So what? Are you saying this is for people who have 4k bicycles already? All I am saying is this is pricey for a mini bike. A good used 1000cc bike is 4k. I must be out of the loop and living in the past. I like it. Its cool. Its an expensive toy for rich people. More than 56% of the US population lives in cities / metro areas of more than 1 million people. For these people a motorcycle like this can be transportation not a toy. Both of these bikes fulfill the same role as a scooter. The top speed of 55 mph is plenty, you don’t need more to sit in stop and go traffic. Yes, you are out of touch with the cost of motorcycles today. Original MSRP 1969 $ 395. Proving the point of a healthy profit margin….Honda will prove the market and the rest will drive the margins down…can’t wait!! The Monkey is not a minibike. It is a small motorcycle. It’s got a 10″-longer wheelbase and weighs 100 lb more than the original Z50s. Yain’t gonna be able to pick this one up and stick it in the trunk of your car. It’s also street-legal and can keep up with in-town traffic, unlike a Z50. I’m not saying that as being a bad thing — I just hope no one is expecting it to be sized like the originals. Cub has a cute little catalytic converter even! Twelve volt system or six? Can an updated Trail 90 (125) be far off? Both of these beautifully styled bikes pay homage to Honda’s own history. And that, coupled with the memories a great many of us have with the two-wheeled ancestors of both models should assure their being a sales hit. Of course if dealers charge a “premium” (read: usurious markup) then all bets are off. They will still sell but not so much as they would if the price were not jacked up. Memories. Both bikes are made to take you there and back again. It’s about time Big Red paid homage to it’s own history instead of ripping off Harley’s. I look forward to riding my own Super Cub 125 and if things go right, Honda will bring back their Scrambler series (sans the tubed wheels because they can make spoke wheels without tubes now unless they’re too frickin’ lazy). It’s not just “nostalgia” that sells. It’s the memories we associate with a product such as these two offer. Well done with the Monkey and Super Cub, Honda. About damn time too. Color match that black headlight bucket on the Monkey. Guys, from now on. every time someone comes up with a negative comment about either of these new bikes from Honda, just let it go, leave it be. Do not try to change that person’s opinion. By doing nothing you will only increase the chances that you will snag one of these bikes when they come to market. 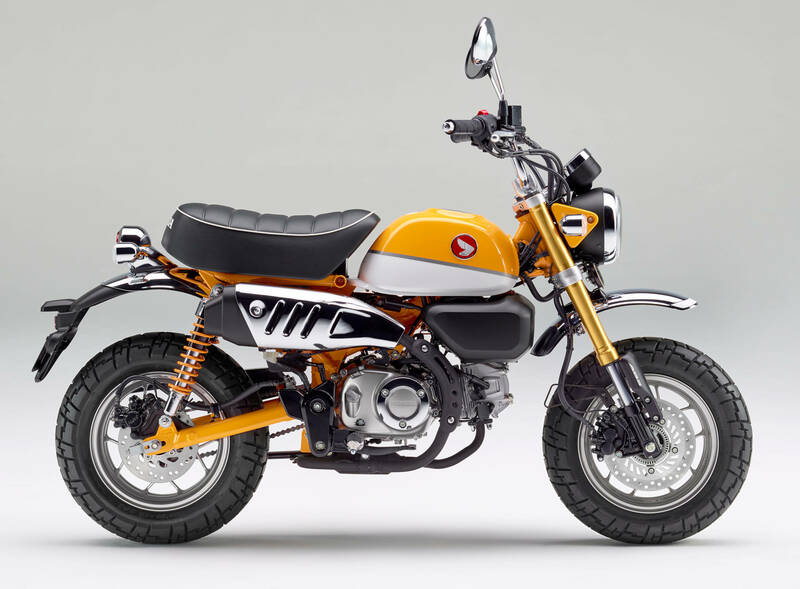 Honda should have produced the new Monkey instead of the Grom. Bringing the Monkey to market now is just competing with its own market share for the Grom. New Cub looks nice, but ABS is just overkill, so does the $3599 price tag, for that amount you can easily get a 250 or 300 machine capable of sustained highway speed for hours. Let me guess: you’re not a marketing genius. The Grom has been a huge seller. ABS is not overkill as it’s now an inexpensive feature and certainly nice to have for the newbies who’ll be attracted to a 125cc scooter. The price is fair for a jewel-like motorcycle and quite a bit cheaper than a Vespa. If a person is interested in riding a 250 at sustained highway speeds, that’s their prerogative. I don’t see how it has anything to do with a 125cc scooter that’s targeted towards townies, the RV crowd, students, etc. These bikes (and the Grom) are far bigger sellers outside of the US. We’re “small potatoes” to these companies. Great fun to ride one of these Carl. You can blast the throttle wide open and our esteemed traffic officers will not even notice : – ) And you can also trail ride a bit. I’ve been saying I want a TRAIL BIKE. I don’t need 48 inches of suspension travel and 75 h.p. I just want to putt around in the woods. 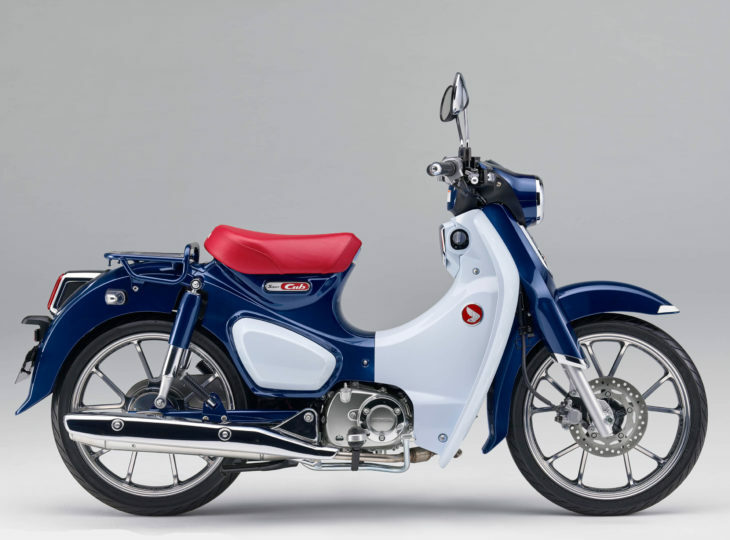 Honda says they will bring the Super Cub in limited quantities. If that is the case, you’ll be lucky to get one for under $5k. Never in my life have I ever been moved by a scooter design or thought that I would want to own one, but damn do I like that Super Cub. I’m not even sure why it presses the right buttons. It’s very simple Jeremy. It’s a CLASSIC! Hopefully much of the hot-kits for the Grom will work on the Monkey! Hop up the 125 to a 150 or better, make yourself a Super Monkey! I’ll take mine in banana hammock yellow.. Coolio! Now if only that Super cub had seating for two….. It has rear passenger pegs. The seat for two would hopefully be an option. The passenger seat mounts to the luggage rack. Look closely and you can see the passenger footpegs. I think the passenger seat fits over the luggage rack. I read elsewhere that a passenger seat that fits on the rear rack will be available. It already has passenger pegs. Passenger pegs are standard. The passenger seat is an option and attaches to the rear rack. Buddy seats for this and Trail 90s have been around for decades. With Honda’s enormous production capacity for Super Cubs, and the growing market presence of scooters and electric bikes, I figured it was a no-brainer for them to sell them here, I just wondered IF they would. Put me down for one. I’ve always wanted one of these, but I was too young the first time you could meet the nicest people on a Honda. Tickled. How do you not buy at least one of each, in every color? Buy both , maybe to look at or for a ten year old to ride. Once an adult rides either of these two turtles your reminded they produce just 9hp. Yup! My KH100 had about 12 hp of FREEDOM! uh-oh, immediately hooked on that gorgeous super cub. i’ve been ogling electric bicycles, but i’ll take that cub any day of the week. all i need it for is cruising slowly around town, along the beach, visiting nearby furniture consignment shops. yeppers, can’t wait. white tennies, red shirt, blue jeans, white helmet, uh huh! We all know the “monkey” name won’t make it to the U.S. Yes, it will.. Check the Honda USA website. Both look just great. They should appeal to (*AHEM*) the much maligned (on here, at least) “boomers”. In other words, people with the wherewithal to make such purchases. By that I mean buying something because it strikes a chord from your past. These two motor bike/scooter setups are from the school of the “strings attached”. And the only strings worth having attached are heart strings. I pity the sorrowful generation of today for what will constitute (more constipate) their memories in years to come. Musically? cRap. Clothing? Baggy pants or those dorky snort-shorts that make them look like Munchkins. Motorcycles? Nada. Zip. Zilch. NAGDT (think about it). Bunch of Emo-SNAGs or at least the majority of them. I will be purchasing a Super Cub. Not only because I can but more so because I want to. If it makes me deliriously happy, I may add a Monkey to my garage. Making and then importing these two excellent looking scoots into the USA almost makes up for the way they screwed the pooch with that stupid new Goldwang. Almost. Yup–I am digging the cast wheels on the Cub. I need one. Well said, kagato. Well said, indeed! I hope you’re right! You forgot, “Get off of my lawn!”. Awesome bikes…with a huge profit margin. They really shouldn’t cost that much. 4$ k buys a ridiculous amount of motorcycle/scooter these days.. But it has upside down forks! Had a 1960 Honda Cub 50 (my first ride). Have had many motorcycles since then but have had a soft spot for them ever since. My original cub kept up with city traffic, so a 125 should be just fine in that environment! Cool bikes, seems on the high side to me though. Finally, the wait is over.. I’m in for one of each.. Big thanks to Honda! I love both bikes. But I will probably buy the Super Cub. These are sooo cool! That’s right – where to use them? Everywhere where are present cars/ trucks you are with these underpowered toys in great risk. They would come in consideration in parks and localities, where cars are not allowed. But then, local rules do not distinguish between types of vehicles. They simply state: “No motor vehicles allowed”. Besides, they should not have required license plates. These bikes work anywhere you could ride a scooter (or a Grom). The Grom goes 55 mph and these bikes use the same 125cc engine. If that Super Cub sells for anything close to $3,600, Honda will be surprised at how many they will sell. I for one will buy one. love it! banana yellow for me. Some bikes just make you smile, and these are perfect examples. Sure they are limited in the ways you can use them, but find a way and you will have a ball. Above all, motorcycling should be fun, and Honda has given us a couple of new/old ways to remember that. Thanks Honda, good job! Beautiful supercub! 125cc has plenty of power moving around in cities or suburban areas. Very easy to park and super fuel economy. I’ll get one someday for sure…I wish the price were lower, like $2k that would sell like cup cakes! Great news! I will take a yellow monkey. Maybe two. Love these things. I have no idea where I would ride such a contraption, but I’m 100% in. In the early 70’s I had a ’69 Mini Trail 50 and a ’73 CT70H Trail 70. The most honest and fun bikes I’ve ever ridden. Honda really nailed the look (except the around the world exhaust). Maybe I’ll get two and teach my wife how to ride. Just finished telling my wife today that we could get a pair and she could learn to ride. Then we can monkey around together!! Dang it! when I was 12 I was too big for a Z50, and at 6’4″ now, way too big for this bike. What a hoot it would be, though. In the same boat. At 6′ 2″ and 240#, for the first time in 50 years I wish I were smaller–the red-white-and-blue Super Cub is a beauty!